The LRWP brings focus to water quality goals, gaps, and the education and outreach efforts required to generate the action necessary to improve and maintain water quality and water resources in the LRW. The LRWP is concerned in particular with historic industrial growth and attendant dumping of pollutants that left a legacy of contamination in the River. Although dumping is much ameliorated, current contamination levels in many stream segments are unknown, and no comprehensive assessment of water quality for the LRW has been performed since the 1970s. Additional threats to the watershed include combined sewers, an average of 34% impervious surfaces, and significant non-point pollution including litter and trash. The LRWP received a grant from The Watershed Institute to develop a State of the Lower Raritan Report. 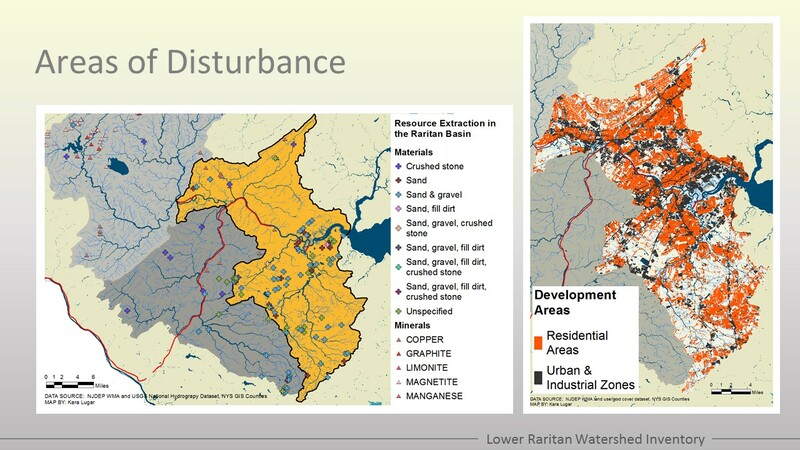 This document will establish a baseline statement regarding historic pollutant impacts in the Raritan River and sub-watersheds. It will be completed Spring 2019. The LRWP looks at the cross-boundary issue of stormwater runoff, advancing in particular the benefits of Green Infrastructure as a tool to reduce the effects of stormwater runoff. As part of this effort we are working with the Middlesex County Office of Planning on developing a set of “natural asset maps” for the watershed. Activities include a speaker series “Prioritizing Green Infrastructure for the Lower Raritan Watershed,” partnerships with the National Oceanic and Atmospheric Administration on Green Infrastructure for Coastal Resilience workshops, and mapping stormwater outfalls. We are also planning for “The Run Off” demonstration project in New Brunswick for 2019-2020. “The Run Off” will be a community-wide “performance” of stormwater flows. This project has been developed in partnership with our friends at coLAB Arts, and with the Rutgers Cooperative Extension – Landscape Architecture division. Another on-going focus, and an offshoot of the natural assets mapping work, is a project to identify state, county and municipal policies that serve to preserve forests as well as policies and practices of NGO’s that acquire land or easements to preserve forests. We are working with Rutgers School of Environmental and Biological Science researchers to 1) establish a baseline of existing policies and practices related to the preservation of our urban forests; and 2) to use land use change, as documented in GIS data, to look for patterns of change. The ultimate goal is to develop ways to evaluate effectiveness and need for these policies and practices. Contrasting with forest and wetland cover is development, shown here as residential and urban areas, and resource extraction operations. The spread of development has clearly fragmented habitat across the entire watershed and lead to problematic encounters between people and wildlife. A key challenge as we move forward will be balancing the needs of natural systems and people. The LRWP is a collaboration of community, government and academic groups organizing around water quality and EE on the path to conserve, enhance and restore the natural resources of central New Jersey’s Lower Raritan Watershed. We formed because watersheds do not conform to political boundaries, so often it does not make sense to focus on a portion of a river that lies within a particular city or county. Managing a watershed as a whole achieves better conservation strategies that work with the natural layout of the land. Cooperation increases the ability of organizations to effectively handle watershed problems, which in turn leads to better economic and scientific management of the river and its watershed.